Today was my day off from exercise, but I had a long list of projects to cross off the list. What is it about sewing lately that has me spending so much time at the hardware store? Looking up and down the aisles through a quilter's eyes is fun, because I find myself trying to think of alternative uses for the home improvement supplies. Hopefully today's WIP will be ready to show off tomorrow. Why can't I get any of these projects done in one day? Sewing is such stationary business. Unless you're crawling around on the floor basting a quilt, it's easy to get focused at the machine and end up sitting for hours. When my toes were injured at the beginning of the year, it was great that I could still sew. Now that I'm healed, I get to exercise away the consequences of those shenanigans. When I'm sewing, I put my iron as far from my sewing table as possible (in another room) and I iron my blocks between every join so that I am never sitting for very long...sitting drives me crazy! (and I exercise every day)! I do this too, at least until I get really involved in the sewing and forget to press! I love this! 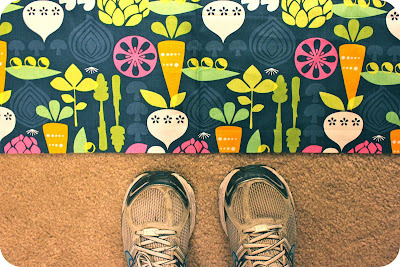 Strategic iron location is such a great way to ensure that you keep moving even while you're making progress on a quilt. 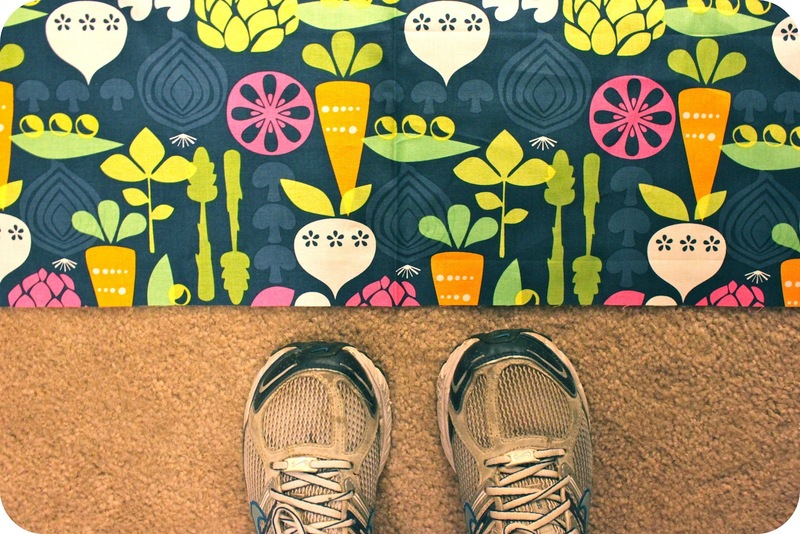 Thanks for sharing such a great idea for keeping the blood flowing while sewing! I've been wearing a pedometer (almost) daily for a couple of years now. It definitely keeps me honest about how much I'm moving around in a day. If I've spent a lot of time sewing on any given day, say more than an hour, I have a 10-minute yoga/stretching routine I do before bed. It helps ease the tension in my shoulders and back. Yes! I wore a bodybugg last year (before the wedding). It tracked activity like a pedometer. Alas, the company won't make it compatible with the most current Mac OS, so it's useless to me now. Lame. Anyway. I was so surprised to see that while I was sitting in my chair working I was burning about as many calories as I did when I was dead asleep. Yikes. Having a tool to track my activity definitely kept me honest!